Lost Highway Blu-ray Review. Lost Highway is a thoroughly complex and challenging work from one of modern cinema’s true auteurs, and as multifaceted a study of the inner world as has ever graced the screen. 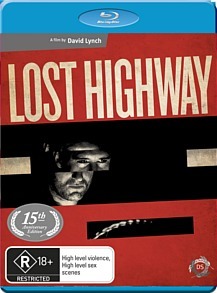 As has oft been noted Lost Highway is a difficult enough film to digest, let alone critique. For its first 50 or so minutes it plays like a noirish mystery, not unlike Blue Velvet or Mulholland Drive, before disintegrating into an hour-long miasma of dream-logic and unrelenting Lynchian surrealism. Just like Blue Velvet and Mulholland Drive, come to think of it. I studied Lost Highway during my first year of uni and fell in love instantly with its languid visuals, its strangeness and its audaciousness, and I still think it’s one of the most immersive and atmospheric films ever released. The general consensus at the time of its release in 1997 was that it marked something of a return to form following the critical and commercial disaster that was Twin Peaks: Fire Walk With Me, but that when all was said and done the film didn’t entirely hold its own against Lynch’s previous directorial high points. This may be, but as a masterwork of surrealist cinema Lost Highway nonetheless stands as a potent dissection of fantasy and desire, and of the boundaries diving the two. Its narrative has been called cryptic by some, incoherent by others, but there’s no denying it’s completely engrossing in spite of (or perhaps because of) its puzzle-like complexity. Featuring uniformly intense performances from Patricia Arquette, Bill Pullman, Balthazar Getty and a singularly haunting Robert Blake as the ‘Mystery Man’, a character that could only exist in a David Lynch film, Lost Highway is a thoroughly complex and challenging work from one of modern cinema’s true auteurs, and as multifaceted a study of the inner world as has ever graced the screen. Its soundscape combines the contemporary rock stylings of Rammstein, Marilyn Manson and David Bowie with typical jags of Psycho-esque violin caterwauling, and sounds absolutely amazing in DTS-HD 5.1 – almost as pungent and immersive as the film itself, and the perfect complement to its stunning visuals. Speaking of which, Madman’s new HD transfer is likewise a thing of beauty, with nary a blemish or artefact to be seen. Quite a lot on offer in this regard, including an original 1996 interview with Lynch and subsequent interviews with Arquette, Pullman and Robert Loggia, as well as two featurettes and a couple of trailers. The disc also contains chapter breaks, which Mr Lynch would surely disapprove of given his repeated avowals that his films are designed to be watched in a single setting. Naughty, naughty Madman!